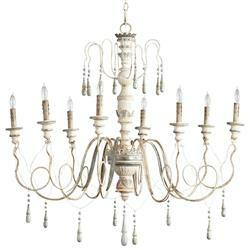 Fans of Gustavian style and French Country style lighting, rejoice! This lovingly distressed eight light chandelier delivers all the understated elegance and textural interest to make it a natural choice. With looped arms adding a sense of motion and decorative flourish, this is a classic example of how fun French Country style chandeliers can be.